I'm back in Brooklyn after a week and half in Los Angeles and San Francisco. There was much sun in Los Angeles though it wasn't nearly as hot as I had hoped it might be. I had planned on throwing myself into the Pacific Ocean. The most I could muster, though, was wading my bare feet into the surf. San Francisco was rainy. Fine by me, as I think San Francisco shows its most beautiful self under a steady drip of rain. While on the West Coast, I ate Dungeness crab and a salad of chicory and grapefruit salad. I dined at Jeremy Fox's current post, Rustic Canyon, where he is playing California cuisine in a new key. Pozole verde with clams; raclette on a toast raft, a buoy in a rich chicken broth. I also returned to my other favorite Fox's restaurant, Commonwealth, in San Francisco. Eating there is like a homecoming. I've eaten Jason Fox's food so often his dishes ripple with nostalgia like they were the cooking of my youth. At no time during my trip did I hanker for oatmeal. At a lovely new café in downtown San Francisco called Heyday, there was steel-cut oatmeal on the breakfast menu when I visited. No way. I had an egg, mushroom and crème fraîche sandwich. Oatmeal is for the deepest, coldest moments of winter. 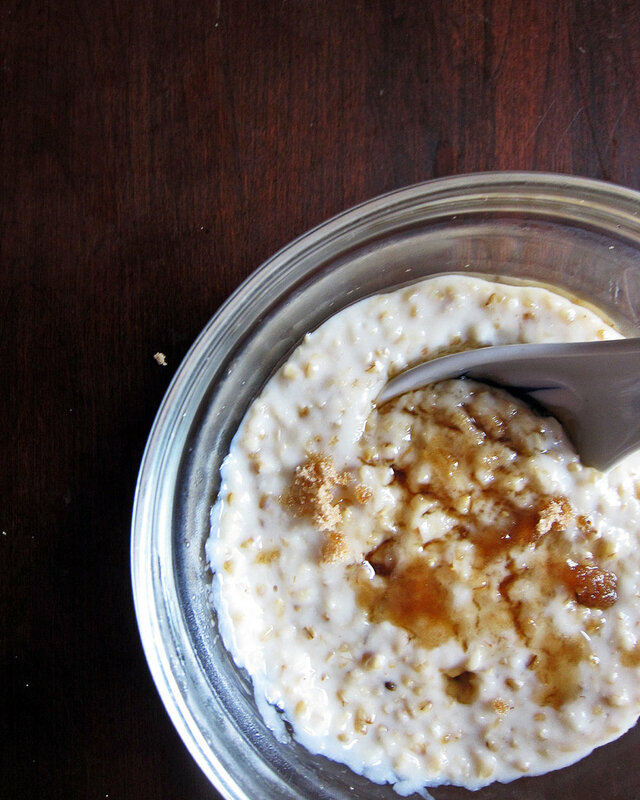 So when I landed back home, I reached for the jar of steel-cut oats in my freezer. The recipe is a near-slavish replica of one from Cook's Illustrated. It's precise but easy. What you get is oats that have given up their starch but retained their bite. An oatmeal pudding with gentle resistance. It is great with maple syrup and brown sugar, of course. Me, I've been topping my oats with tea-macerated prunes with lemon zest, a recipe from Judy Rodgers that is also designed as a complement to savory preparations like roasted duck and quail. The prunes are haunting. Sweet, sure. But also intense and floral, thanks to the concentrated fruit and the lingering taste of lemon. I've made oatmeal this way a handful of times already this season. With the continuing onslaught of snowstorms impending, I bet I'll be cooking it at least a few times before winter fades. This recipe makes a lot of oatmeal. If you're cooking for fewer than four people or for people who only eat a little oatmeal at a time, refrigerate the leftover oatmeal. When you're ready for another serving, plop the chilled oats into a saucepan and add some water. Cook over low heat and stir regularly. Presto! Oatmeal all over again. In a large saucepan set over medium heat, bring the water and milk to a simmer. Meanwhile, in a small skillet set over medium heat, melt the butter. When the butter begins to foam, add the oats and cook, stirring constantly, until the oats smell toasty, about 2 minutes. 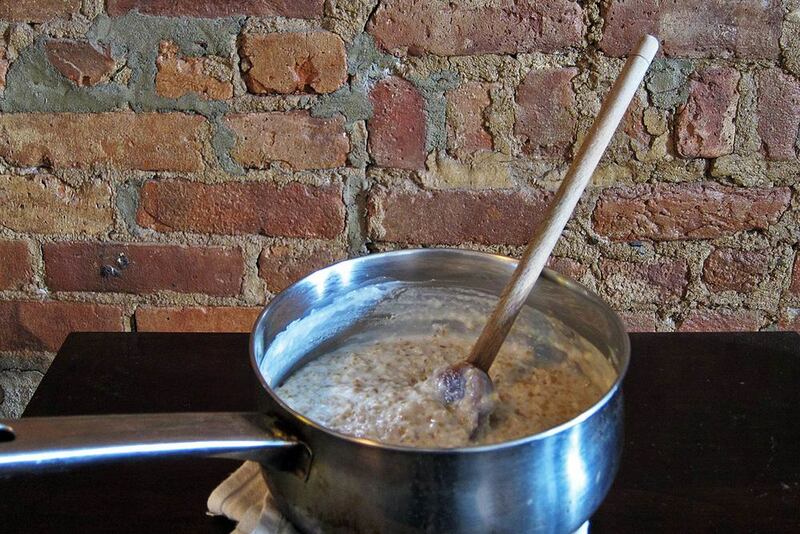 Add the oats to the simmering liquid, then reduce the heat to medium-low. Cook without stirring until the liquid has reduced and thickened and has the texture of gravy, about 20 minutes. Add salt and stir with the handle of a wooden spoon. Continue cooking, stirring occasionally, until the oats have absorbed almost all the liquid, about 10 more minutes. The oatmeal should have the texture of pudding. Turn off the heat and let sit for about 5 minutes. Serve with your favorite topping—or whichever you have at the ready. The original recipe has doubled proportions. The prunes keep for ages in the fridge. So double-up, if you'd like. Bring the water to a gentle simmer and add the tea. Turn off off the heat and let infuse for about 8 minutes. Stir in sugar to taste. It should be quite sweet. Cool until the liquid is warm to the touch, about 120°F/50°C. Place the prunes in a storable jar or bowl. Add the zest, but don't pack the fruit into the container. Pour the tea over the prunes so it just covers them. Cover, or if storing a bowl, submerge the prunes with a small plate. Let finish cooling completely, shaking or stirring a few times, then store the prunes in the refrigerator. When serving with the oatmeal above, be sure to add some liquid along with the prunes themselves. Instant syrup.